Nappy rash also called diaper rash, is an irritation of the skin in the area that is covered by a nappy or diaper. The condition is very common in babies and is neither a disease nor an infection. The condition is simply a surface irritation on the skin that results in pain, swelling, and general discomfort for the baby. Common nappy rash is recognised by the inflammation of the skin in the nappy area. When this irritation is present your baby may cry when his/her nappy is wet or soiled due to a stinging sensation caused by the contact of urine or feces to the skin. Your baby may also be more fussy than usual, have trouble falling asleep or staying asleep, and offer protest at being held in a way that puts pressure on the inflamed area. In severe cases of nappy rash you may also notice the occurrence of blisters or small ulcers (open sores) on the skin. If you notice that the rash is bright red in color, very warm, or swollen, or if your baby is also running a fever then the rash may actually be a fungal or bacterial infection. In these instances the culprit is not common nappy rash and you need to contact your baby's pediatrician for treatment. The most common cause of nappy rash is prolonged skin contact with a wet or soiled nappy. When urine or feces is left to sit too long ammonia is produced which can irritate the skin and cause inflammation. Chemical residues in the cloth of the nappy can also cause a rash. The substances found in disposable diapers can irritate your baby's skin especially if an allergy is present. The laundry detergent, fabric softener, or soaking solution used to clean cloth diapers can also irritate the delicate skin of some children. The air restricting qualities of plastic pants, which are often used on top of cloth nappies to prevent leaks, can further increase the occurrence of nappy rash. The plastic material prevents airflow that could help keep the area dry reducing moisture build-up on the skin that can lead to irritation. The best way to clear up a case of nappy rash quickly and effectively is to take a multiple action approach. Start by giving the irritated area plenty of air exposure. Whenever practical leave your baby's nappy off for at least 15 minutes to one hour two to three times each day. The boosted airflow over the rash will speed up healing time and keep the area dry and ammonia free. Next, make sure that you change your baby's nappy more frequently during bouts of nappy rash. Watch for the first signs of wetness and change the nappy immediately. Also, make sure that the area is completely dry before applying a new nappy. Another way to protect the rash from further irritation and prevent the build-up of moisture on the skin is to apply a nappy rash cream after each diaper change. Barrier creams that are sold specifically for nappy rash in the baby aisle of most stores contain zinc, which prevents wetness from touching the skin and also offers soothing qualities that can reduce a baby's discomfort. Since baby wipes may contain alcohol that can irritate the rash you may also want to skip this step when changing your baby and opt instead to use a natural cloth dampened with warm water. If the nappy is also soiled you can add a mild soap to the cloth but make sure that you thoroughly rinse and then dry the area. Another option is to try switching the type of nappy that you use until the condition clears up. If you currently use cloth nappies try using disposable ones and vice versa. This switch can sometimes help eliminate the original cause of the rash. Although nappy rash is quite common and easy to treat it is best to avoid the rash altogether if possible. 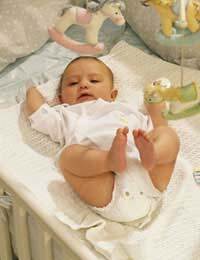 Since nappy rash is more common in babies who wear cloth nappies the switch to disposable nappies is usually a wise choice. If you prefer to use the cloth variety make sure that you change your baby more frequently and avoid the use of plastic pants. Another way to help prevent nappy rash is by choosing the correct cleansers. Only use wipes that are alcohol free, ones that contain mild detergents, and ones that include a lotion to soften skin. The same goes for laundry detergents and fabric softeners, avoid any harsh chemicals or unnecessary additives. Finally, avoid the use of powders after nappy changes if possible. The powder can absorb the urine and hold it close to the skin, which can cause irritation. Plus, the absorbing qualities of the powder may make it harder for you to tell when a nappy is wet and lead to less frequent changing. Even with every precaution in place your baby may still develop nappy rash. Do not fret. Common nappy rash is not a major condition and as soon as your baby is out of nappies your rash worries will be gone.